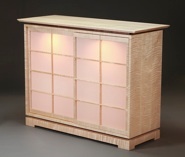 Capturing the essence of shoji screens, these cabinets bring a distinct Asian flavor to any room. They are excellent for buffet use, media/electronics, office credenza, books or art display. Tell us your use, and we can offer a number of interior options to enhance the function of your cabinet. The benefit of sliding doors is that they are never swinging out in the middle of a traffic area. 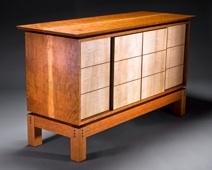 Each cabinet comes with four equal sized doors made of bookmatched Curly Maple trimmed with either Wenge or Walnut beadwork, and are built on super hard, self-lubricating Rosewood guides that slide effortlessly in the lower tracks. Your cabinet can be built on either our “tall leg base”, or our standard low base, and can be sized to any dimensions you require. Similarly, wood choices are up to you, depending on availability. Curly Maple doors with Wenge beadwork trim. Comes standard with 3 adjustable shelves. •For wire and cord management, we make the shelves and interior partitions with semi-circular cut-outs along the back edges. •Optional interior drawers are also available. Great for silverware, small office items, or CD/DVD storage. Call for pricing. •Optional doors w/ Acrylic/Fiberglass panels and interior lighting (right) create the true effect of traditional rice paper Shoji screens with long term durability and zero maintenance. 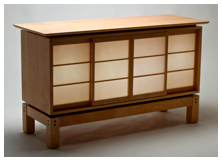 The doors frames themselves are made of the same wood as the rest of the cabinet body unless you specify otherwise. 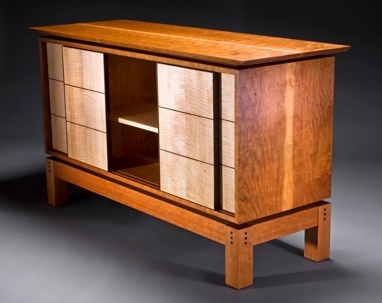 •Low base (below): The cabinet on our low base will have a distinctly lower profile than if built on the tall leg base. This often often works well if you are using it with a flat screen TV, because of the optimum viewing angle of the TV screen. 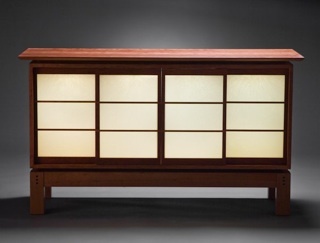 •Flared Legs: When combined with slightly curved apron rails and a rounded edge to the floating top, these details add a little softer touch to your shoji cabinet. Optional doors w/ Acrylic/Fiberglass panels and interior lighting. 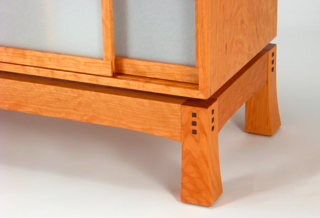 Cabinet, base, door frames, and floating top are figured Cherry. Flared legs and curved apron rails. 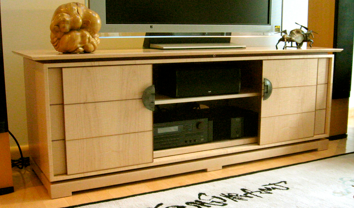 Solid Curly Maple cabinet on low base, Walnut trim. Curly Maple doors with Walnut beadwork trim. Comes standard with 3 adjustable shelves. 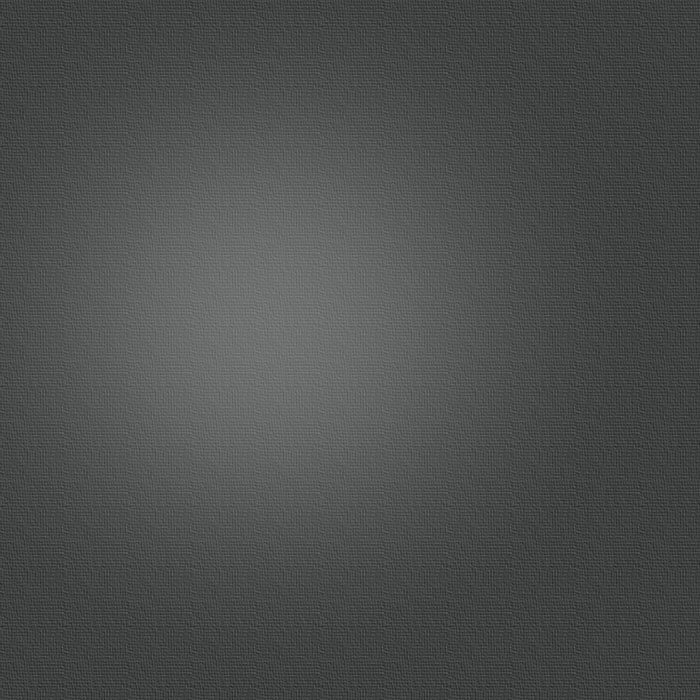 Round hammered steel handle is optional.